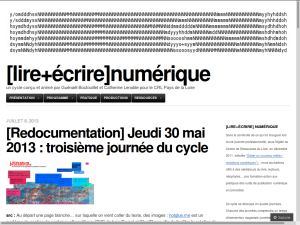 Le 1er juin à Nantes j’ai assisté à la seule intervention sur la littérature numérique au sein de la première édition du festival littéraire Atlantide à Nantes. L’intervenante était… Catherine Lenoble qui m’avait invitée au même moment pour une intervention autour du même sujet. Les exemples et les références qu’elle a fournis me sont très chers, en plus qu’ils se trouvent en ligne. A explorer! 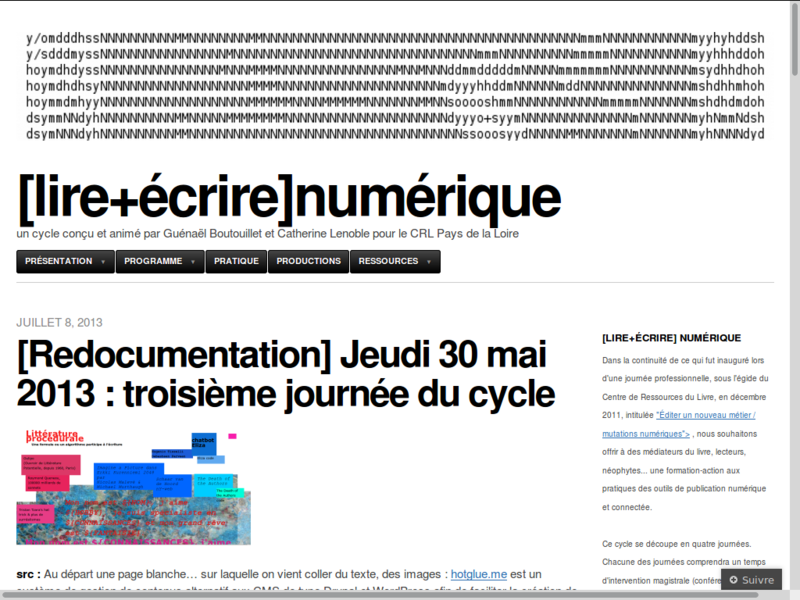 tout comme des interventions passionnantes par Olivier Ertszscheid et Laurent Neyssensas sur L’état des lieu du web citoyen et marchand et de Lionel Maurel sur les Copy-partys. From 8th till 10th October I invited five artists for a workshop around i-literature in Constant Variable: Catherine Lenoble, Olivier Heinry, Stéphanie Vilayphiou and Nicolas Malevé. All of us are hybrid artists with a special interest in literature. We knew bits and pieces of each others’ work, but I was curious to see what common grounds we would find in our approaches towards electronic literature, the experiences, the likes and the dislikes. It was great to be able to go into depth throughout the presentations of our work. Five different aspects of interesting i-literature experiences came out of this encounter: intertextuality, distributed works, the challenge of accessibility and licenses, collaborative processes, working with algorithms and parameters. Of course, sometimes a work contains more than one aspect at the same time. Below you find the list, with for each aspect concrete examples of the works that were presented. At the end of 2013 we plan to make a publication based on the content of this mailinglist. This workshop was possible thanks to the support of the Vlaamse Gemeenschapscommissie. A new way of reading? Or just another way of profiling? I did the test with the programs of two Belgian political parties. Today I participated in the online reading session organised by Sönke Hallman and Falke Pisano, exploring the idea of a #collective textual performance#, approaching the text by #reading with the intention that the text becomes a place#. After reading the excerpts, we all started to invest the ‘text-place’, straight onto the wiki, while we shared our impressions by chat. From straight Courier 11 laps-of-texts, we tried to turn them into inhabited decorated ‘text-places’. It is a good way to ‘live’ a text. Having studied literature and literary theory, I realized I was looking with preset and limited eyes to the electronic library, trying to make out on which criteria I would build my judgement in commenting on them. Time, space, perspective, plot/story, style, composition do apply on these works, but so many more things come into the field, e.g. 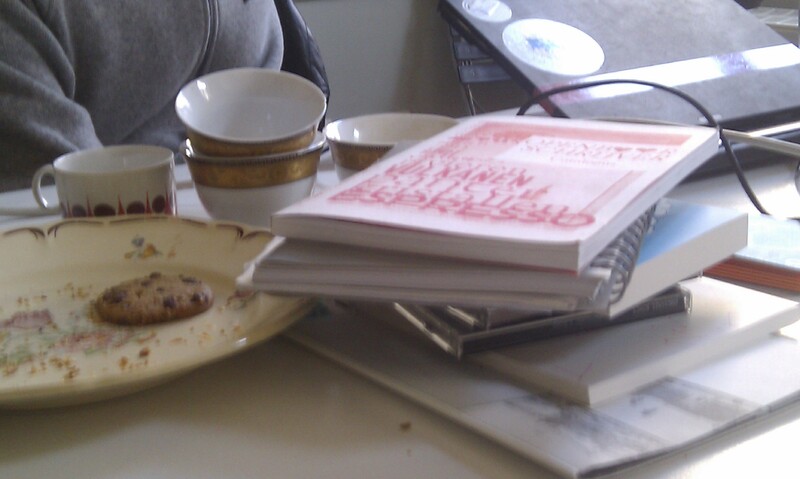 the combination of image/sound/text; or the (in)finite ways of reading and using it. I hoped I would quickly find the cyber orientated incorporation of my favourite literature porfessor. I felt a big relief when I started reading Katherine Hayles’ Writing Machines. When reading the exquisite book ‘Bellwether’ by Connie Willis, I realized my favourite spot in town could be run down very quickly. Sandra Foster, the main character, an academic researcher on fads and trends in society, goes daily to the public library. Apart of taking out the books she really needs, she strategically tries to ‘rescue’ the classics. Books that haven’t been taken out for six months, are taken off the shelves and sold. She keeps track of the files and takes out systematically the complete works of Dickens, of Brönte, etc. Lisa: I have to research a paper. Where did all the books go? Librarian: Books? Books are for squares! We’re now a multimedia learning center for children of all ages… but mostly bums. (motions to a table full of bums — and Homer — sleeping). Lisa: (looking at the few materials left) “Everybody Poops: The Video”??? “Yu-Gi-Oh! Price Guides”??? Surfing on the net to have a look into the ‘electronic literature’, there is no way I can find the so called ‘first classic works’ in electronic literature (canon works extremely fast) without having to buy them (25$ each). It would be nice to know people are thinking about public libraries for virtual products, places with an organised/historical/specialized collection where you can ‘borrow’ freely 13 items for 3 weeks. In 2006 the public libraries of the Netherlands collaborated with the Design Academy (Eindhoven) to think about libraries in 2040. They published a book (What if/Het boek, Biblion Uitgeverij, 2007) that you cannot consult on their website. You can have a look at the student’s films, of which some ideas are great. Three of the four films are based on the exciting ideas of freely ‘sharing’ content and information in ‘context’, like for example sharing, uploading and downloading books when you are on public transport. The first electronic library collection has been published both on the web and on cd-rom under a Creative Commons License ( Attribution-NonCommercial-NoDerivatives). The collection represents an anthology of sixty works, curated by N. Katherine Hayles, Nick Montfort, Scott Rettberg and Stephanie Strickland. Going through the collection is an easy and exciting way to discover the potentials of the ‘technotexts’ (K. Hayles, Writing Machines). Call for submissions for the second electronic library collection will be somewhere in June 2007. Read & write :-). Furtherfield published a brief review and an interview with one of the curators, Scott Rettberg, hypertext author and theorist (http://retts.net). You can also check out the full directory of ELO, a descriptive guide for more than 2300 e-literature-compositions. Why print or not print in times of online media? How does the grey zone in between ‘on’ & ‘off’ publishing look like? How does it change publishing processes? How does the human race react upon the variety of formats and possibilities? You are currently browsing the Algolit category at Paramoulipist.